Magniflex was born in Tuscany, a land which has always been associated with art and ingenuity. With its stunning landscapes and rich natural environment, the region is an integral part of the Magniflex philosophy, which was inspired by the Tuscan residents and their love for a good life. In its own way, sleep is a form of art. 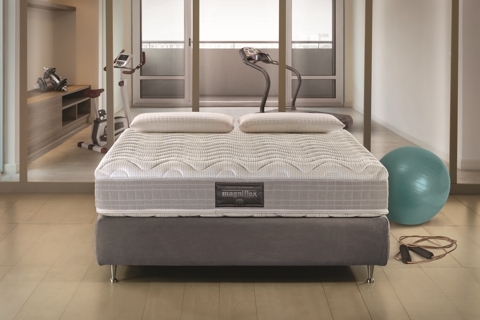 Over 55 years of experience in the industry has made Magniflex instantly recognizable as standing for excellence when it comes to quality mattresses. The Company operates in 98 international markets, with over 35 million customers, 4000 dealers, a wide range of more than 170 products and show rooms located in main cities all across the world. an exclusive mattress with an elegant and fancy design made of materials that are a perfect blend of nature and technology. The inner core features our Dual Core technology, a system that makes it possible to turn the inner layers upside down to achieve different levels of comfort. 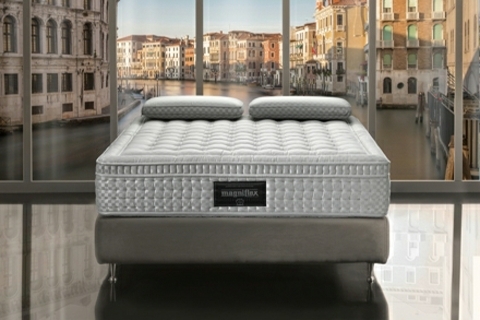 It features a technology that Magniflex has patented in collaboration with the Department of Mechanical Engineering of the University of Zaragoza, is the result of a complex set of ergonomic tests that have led us to develop a new concept of structure, one that can stretch the mattress in response to the body’s weight, thus boosting performance and increasing durability.